i had some unexpected company drop in on me the other morning (pun intended). 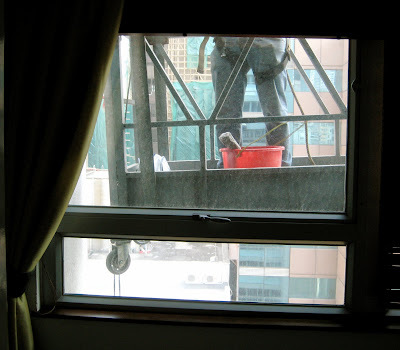 just a subtle reminder that living on the 21st floor doesn't necessarily ensure privacy... shut your blinds. That's kind of creepy! I hope you were dressed! Great capture of the situation. Always nice to have a visual of the Asian bootie. Did you give him a show? You should have started dancing around with you big pregnant belly. That would have made his day!! !